Texting and walking is no longer funny. It has gone way beyond a quick laugh from watching YouTube. People and pedestrians are getting seriously hurt - cuts, bruises, broken bones, concussions, brain injuries, spinal cord injuries, and even death. Texting and walking is becoming more common and more dangerous. This also includes other walking distractions like talking on the phone, listening to music and playing games. People are bumping into other people, bumping into walls, walking into glass doors, falling down stairs, falling into fountains, falling off sidewalks, walking into traffic, and causing traffic accidents. According to data from the National Highway Traffic Safety Administration (NHTSA), nearly 5,000 pedestrians were killed and an estimated 76,000 injured in traffic collisions in the United States in 2012; Although it is not clear how many of these incidents were due to distracted walking, The National Governor's Highway Safety Association data shows that pedestrian fatalities have spiked 11% in 2017 to nearly 6,000. That is a significant increase and could account for the phone use for activities other than just phone calls. 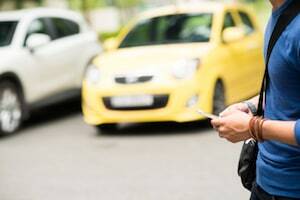 Most U.S. states already ban texting by drivers but not distracted walkers. While some cities try public information campaigns, educational programs, or apps and other measures, other cities like Connecticut, New York, Illinois, Arkansas, and Nevada are considering putting an end to distracted walking. While Fort Lee, New Jersey, has banned texting-while-walking, Honolulu is the first U.S. city to pass legislation - Distracted Walking Law - making it illegal to text while crossing the street. This also includes people using laptops, digital cameras and video games. When the law goes into effect later this year, first-time violators will be fined $15-$35; second-time violators within the same year will be on the hook for $35-$75; and those who get ticketed a third time will be charged $75-$99. A 2015 study by the American Academy of Orthopaedic Surgeons (AAOS) found that 78% of U.S. adults believe that distracted walking is a "serious" issue, but only 29% of respondents admit that they, personally, have an issue. And three-quarters of Americans say it's "other people" who walk distracted.